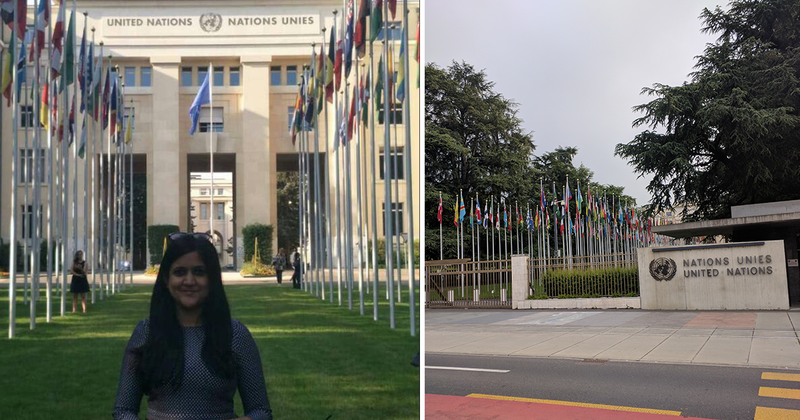 My first few weeks at the United Nations Conference on Trade and Development (UNCTAD) were incredible - in terms of the projects I was working on as well as networking. It felt enriching to be present during high level meetings at the UN where senior diplomats from the UN as well as other organizations like the World Trade Organization, the World Bank, the Food and Agriculture Organization, the International Trade Centre and more, debated and discussed issues that impacted the world and each one of us. Not only did these discussions result in a great deal of learning for me, but were extremely inspiring. I had the opportunity to personally speak to many of these influential people, and it was wonderful to see how open and encouraging they were, always sharing wonderful insights. My main project at UNCTAD kicked off really well. It revolves around developing a methodology for measuring the impact of non-tariff measures (NTMs) on trade that can be used in different countries, with the initial pilot in Ghana. As we try to speak with top officials and put everything in place, I am learning a great deal about how UN technical cooperation projects are implemented. Since I am working on a pilot project, I am realizing the importance of investing time into thorough research and analysis to lay a solid groundwork. For this reason, there is a lot of reading to do, with which comes with a lot of learning and a lot of questions – followed by intense brainstorming sessions with the team. I am being exposed to so many new concepts, which I never knew were so important in the field of trade. My team members are terrific, constantly involving me in a variety of activities and tasks, meetings and want to know my opinions and views. One such project was writing a paper on Trade, Multilateralism and Sustainable Development. My discussions and participation in many of the meetings within the team familiarized me with not only new concepts but made me more aware of the gaps in my knowledge, in turn motivating me to strive harder to further develop my knowledge of international trade - a vast field with multiple legal, economic and political dimensions. What is best is that you get to talk to and learn from the most experienced and the best of the best. I also started working on another research project. It began with some information that I was required to provide based on basic research. But as I dove into it, I realized it was a rather vast field of study which inspired me to go into detail and study more. I read Non-Tariff Measures related chapters for many Regional Trade Agreements (RTAs) to understand what they do to promote regulatory cooperation and convergence. This, in turn, exposed me to a whole new area of study – regulatory cooperation. I spent a couple of days reading legal texts in detail to prepare a comparative analysis of the trade agreements. Further, I was exposed to, and presented in my findings on, the numerous approaches that can assist countries in negotiating regulatory cooperation within trade agreements, drawing from best practises and experiences of countries. In whatever little time I have outside of work (and I do not get much), I try to meet people from other divisions at UNCTAD. Most people are easily approachable and enjoy talking to interns. While at UNCTAD, I learned about a small team working on Trade and Gender. Given how gender is becoming a mainstream issue, I was curious to learn more about what they do, the kind of projects they work on, the gaps in the area, to what extent gender is important in international trade and how governments are working toward making trade equitable for all genders. I contacted a consultant working on the team who was happy to meet me for coffee and share her experiences. It was indeed insightful. In addition, I met more people from the Investment and Enterprise division and learned a lot more about the work they do. Lots and lots of learning – it is mind expanding. I am able to narrow my focus of interest. While I know I am interested in trade and development, this internship is helping me understand what within this broad field interests me the most and what I am good at. Most importantly, it is helping me understand how I must best use my remaining time at the Fletcher School. I am clearer and more certain about the courses I want to take in the next semester to bridge the gaps in my knowledge and develop the right set of skills that are a must in succeeding in the field. My team and supervisors at UNCTAD are extremely supportive and are mentoring me well.